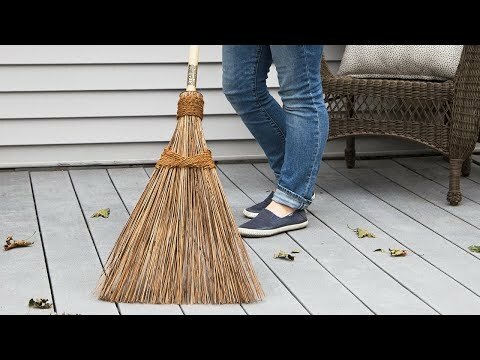 My broom sweeps pine needles and leaves off my porch and lawn just like I want it to. Love this broom. So I ordered one for my sister too. This broom seems to be tougher for all outside jobs than any of the other brooms I've had (and believe me, I've had lots) and it won't bend when I stand it upright. This broom really works on rough surfaces. Swept out the garage faster and better than any broom I have ever used. It is too stiff for indoors, but that is what makes it so useful outdoors. I got it to clean pollen and dirt off the deck, which is hard to sweep, and although I haven't used the broom for that yet (it's winter), I'm sure it will do a great job in the spring, summer and fall. I bet it would work well sweeping leaves, too. This is especially effective on irregular surfaces like cobblestone and slate. Great for landscape debris and even leaves. My sweeper friend was very pleased. She welcomed this innovative product to her large porch. I love this beautiful and functional broom. 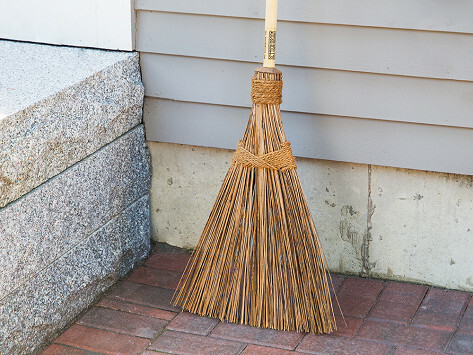 Best broom I've had for outside walkways and porch. I love this broom. It isn't as wide as I expected but when I use it I realize that it's actually just the right width for my purposes. Kind of expensive for a broom but well worth it if it lasts. This broom only needs one motion to capture all the debris. Very stiff and unique design. Great sturdy broom. This is my second one. One for the porch and one for the deck! I haven’t used it yet but my husband said it really does a great job. He swept walks after mowing. Better!Broom is a sturdy coconut palm broom inspired by similar versions long used around the world. During a trip to China, Maker Susan Albrecht noticed locals sweeping up outside using rustic-looking brooms. The simple-but-effective design stayed with her, and when she couldn’t find it back home in the States, she created a better (and all-natural) way to sweep up.